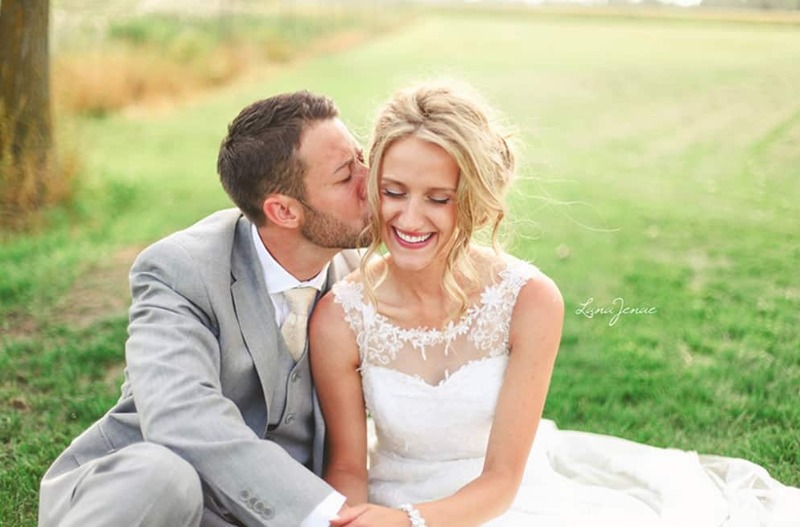 A style trend towards simple, elegant and romantic weddings is on the rise, and with it come wedding dress necklines. High neck wedding dresses are popular this year after the look took over runways, celebrity, and even royal culture! 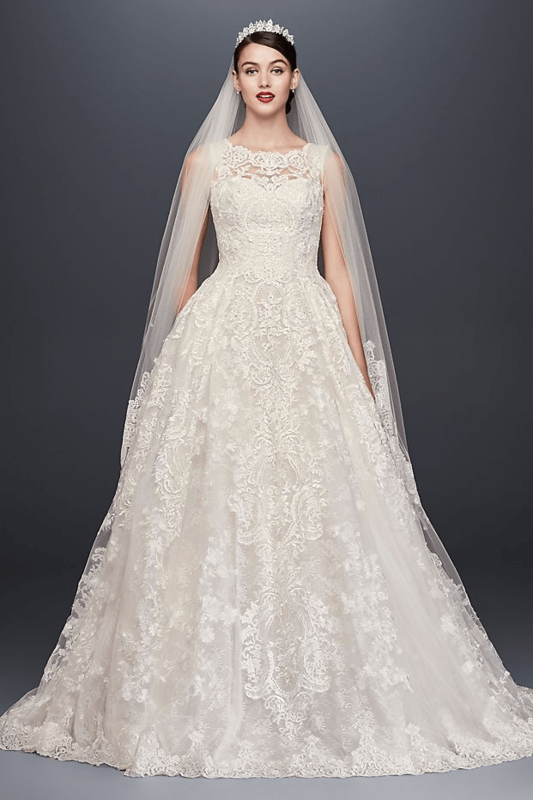 From model and actress Kate Upton’s November wedding in a delicate lace custom Valentino gown or socialite Nicky Hilton who also wore a very high neck Valentino couture gown to supermodel Miranda Kerr’s Grace Kelly inspired gown from Dior last year, the trend towards covered shoulders and lace-edged necklines is here to stay. The trend is prevalent in the royal family as well! With several highly-publicized royal weddings in recent years, the world is watching for fashion inspiration. Although Kate Middleton’s bespoke Alexander McQueen dress was worn in 2011, it’s still a top search for wedding dress inspiration. Sister Pippa Middleton is also a fan of high neck wedding dresses, and she stole our breath in a lace Giles Deacon gown with a high Victorian neckline in 2017. And who could forget the Duchess of Sussex wearing a Stella McCartney silk crepe high-neck halter gown from last weekend? The Duchess changed into a sleek second wedding dress, and all eyes were on her as she climbed into the passenger seat of a luxury E-Type Jaguar car ready to be whisked away to the royal reception! The trend towards high neck wedding dresses has caught on so heavily that Pinterest published it as the definitive style of the year in their 2018 Wedding Report. The inspiration website reported that pins of high neck wedding dresses were up 351% from last year. The search for shoulder-covering boleros climbed 163%. Brides interested in making this classic statement on their day should know that there are several varieties of high necklines. We’ll break down the various styles for you here. Understanding how different styles of high necklines will flatter different body types is key to looking stunning on your wedding day. A high neckline generally flirts with your collarbone or above and rarely shows any decolletage. The subtle difference in how each neckline frames your neck and shoulders makes the difference between an effortlessly elegant look and a frumpy appearance. 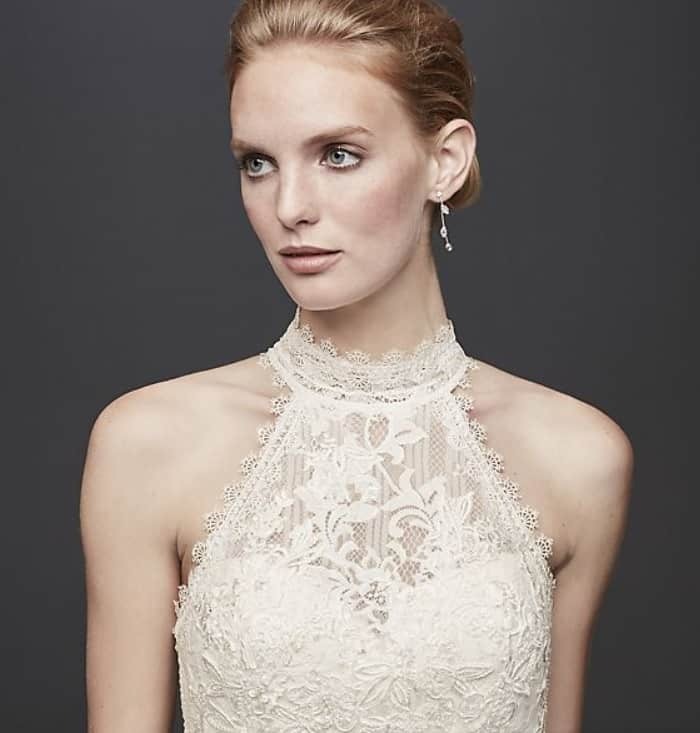 Selecting the right neckline based on realism about your own body type is important! The bateau (or boatneck) style generally skims just under the collarbone in a wide curve. The curve ends nearly at the tip of the shoulder. It is a classic style nicknamed “Sabrina” after a popular black dress worn by Audrey Hepburn in the film by the same name. The neckline is featured equally on short-sleeve dresses or long-sleeve dresses and accompanies any material. This neckline accentuates delicate collarbones and a small chest very well. Thicker necks, shoulders and large chests generally do not look as flattering in this cut. The Jewel neckline is characterized by a rounded neckline without a collar that usually sits right under the base of your throat. Its less elegant name is the “T-Shirt” neckline, as its cut is the same as many casual t-shirt styles. 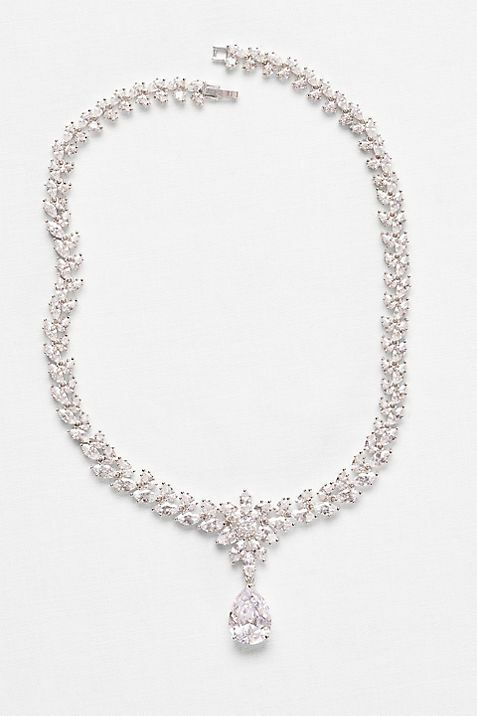 The jewel neckline is flattering in any wedding dress material and tends to showcase wedding jewelry very elegantly. Like the Bateau, the Jewel will work best for women with small chests, as the fitted bodice and high neckline will give the illusion of a larger chest. In fact, the Jewel gives the illusion of a larger chest on everyone, which is something to keep in mind for the already well-endowed. The halter and high-neck necklines are often interchangeable. The halter usually consists of a strap wrapped around the back of the neck rather than two straps across the shoulders. 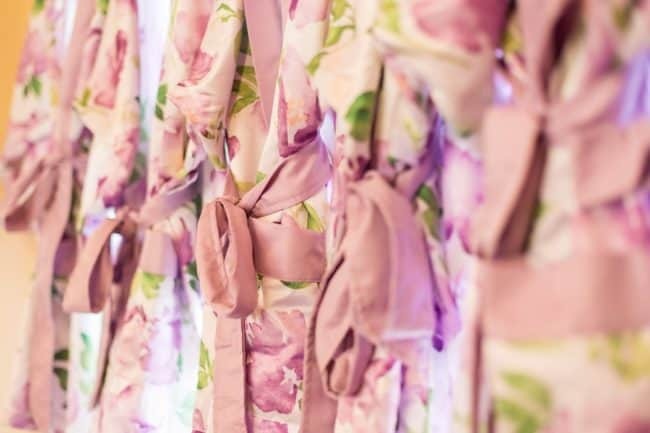 There is more flexibility with a halter neckline on decolletage and modesty, depending on the height of the bodice and the width of the straps. Traditional high-neck necklines are reminiscent of Meghan Markle’s (second) wedding day dress: a high collar around the neck with an attached bodice extending down across the shoulders. Both styles benefit women with broad, muscular and angular shoulders. The cut and fall across the shoulders emphasize them the most, which makes this a poor choice for delicate and narrow-shouldered women, or those with poor posture. This cut also adds drama and length for tall women, usually over 5″7. It may have the illusion of shortening the torso on women any smaller. Finally, the high neck dress can be accentuated with a keyhole in the front for visual interest. 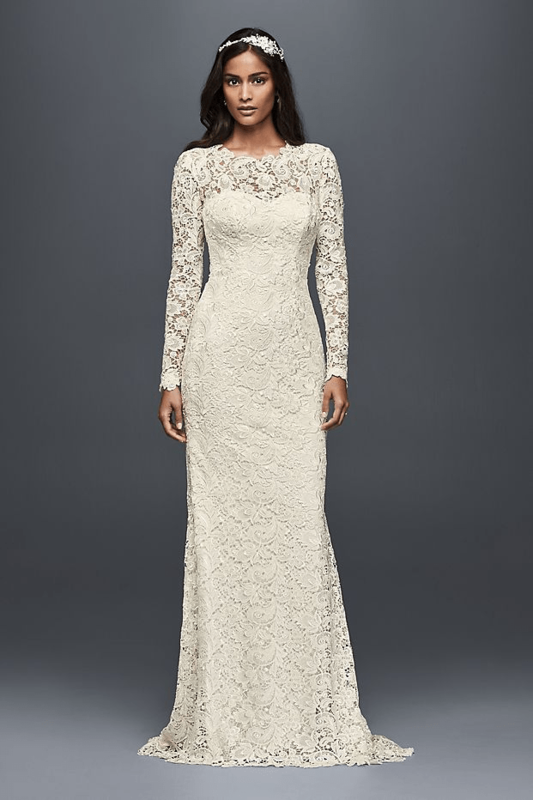 Here are some of our absolute favorite high neck wedding dresses available this season. 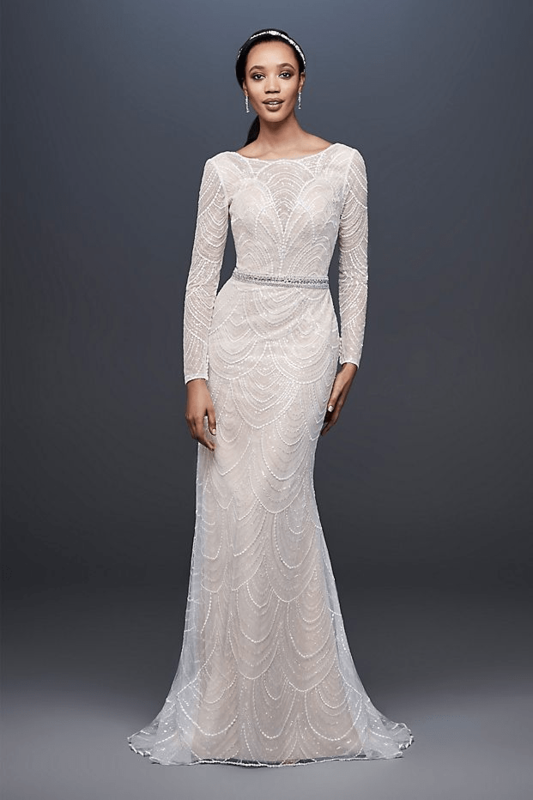 This art deco-inspired sheath wedding dress combines a bateau neckline with dramatic swoops of sequins across the overlay. The waistband accentuates the shape nicely, as well! The gown features over 5,000 hand-sewn crystals and beads for an unforgettable statement walking down the aisle. Check it out here. This dress has vintage couture inspiration written all over it! Use use of lace paired with soutache ribbon appliques give this dress a one-of-a-kind heirloom look. As far as finishes, a low illusion-lace back goes well with the scalloped trim. Perfect for the understated bride with a bit of flair, you can find this gown here. As a bride, you will stun the room making your way down the aisle in this Oleg Cassini creation. 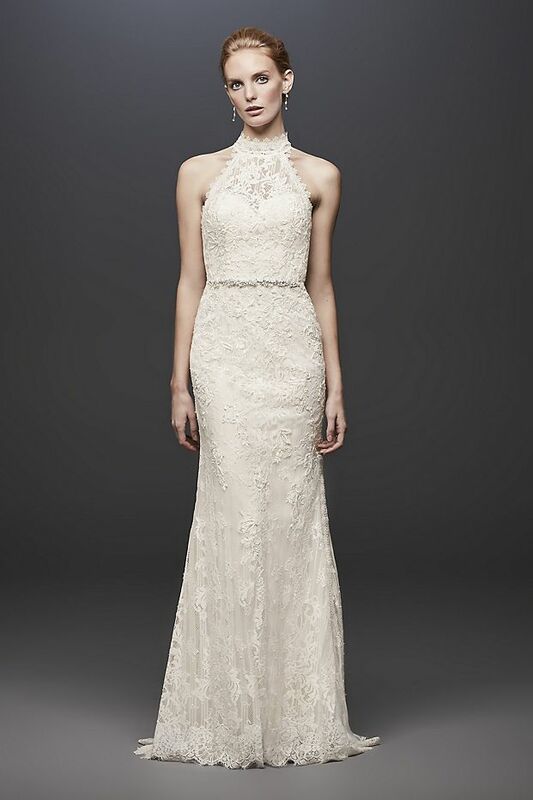 The top of the gown features a lace Sabrina neckline overlay over a sweetheart sheath. The traditional ballgown style features yards of beaded and appliqued tulle in the grand skirt. The gown boasts over 5,000 beads and sequins across sumptuous layers. Finally, the overlay ends with a delicate lace finish at the bottom of the ballgown. A picture in minimalist elegance with an effortless, high-fashion appeal. Perfect for the modern bride or those celebrating a contemporary wedding, this gown also features contoured seams that elongate the frame. The skirt is crepe that flows slightly for tasteful drama, and cascades from a nipped waist that defines the silhouette. 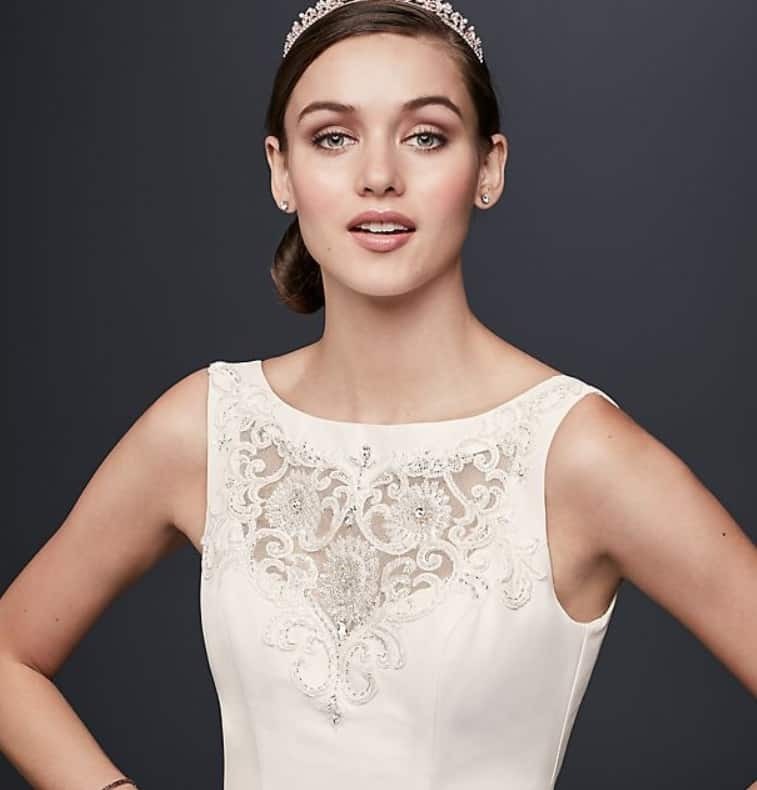 This stunning all-over lace dress by Melissa Sweet features a lace-embellished jewel neckline overlay paired with a sweetheart sheath underlay. The back features a dramatic cutout along the edge of the shoulders down to a graceful point mid-spine. In essence, this gown is the perfect marriage between elegance and flirtation and can be found here. High neck wedding dresses often have enough visual interest to not require loads of jewelry. In fact, some high necklines are better for earrings and bracelets only! Halter gowns and traditional high-necks will look too busy with a necklace. 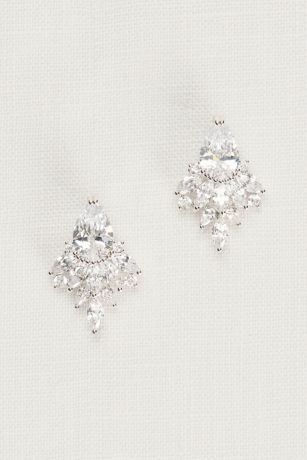 These cuts are best framed by tasteful drop earrings and a flattering updo to accentuate the shoulders. A bateau neckline looks elegant paired with a choker necklace or a short-chained locket. Since the cut frames your collarbones and shoulders, over-sized statement jewelry will look out of place against the neckline. 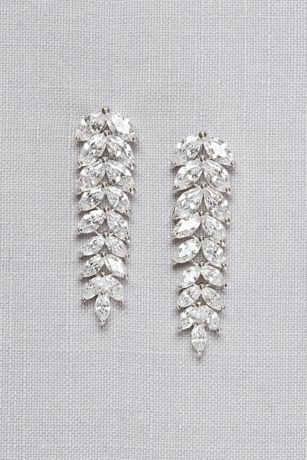 We recommend doing either a delicate necklace or mid-sized studs in your earlobes. 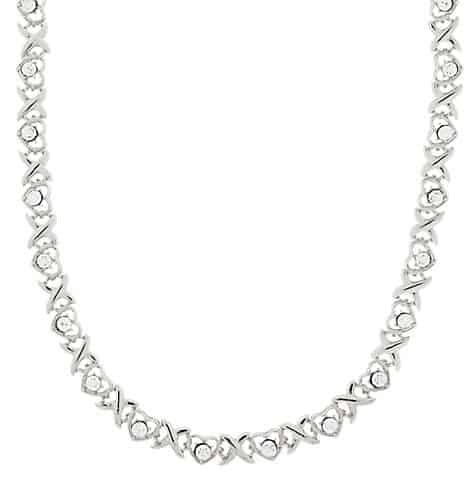 Finally, a jewel neckline of simple, non-embellished material can be paired with a shorter necklace or a longer lariat style. If the material is embellished, paired with a belt or otherwise busy, consider only drop earrings or a simple rounded necklace. 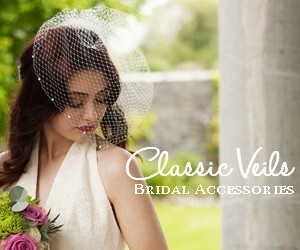 Always take height into account when selecting the perfect veil. Petite women should consider either very long veils with a cathedral train, or short statement veils such as birdcages and blushers. Veils that end midway down the dress or back may give the illusion of cutting a bride in half and highlighting her shorter frame. 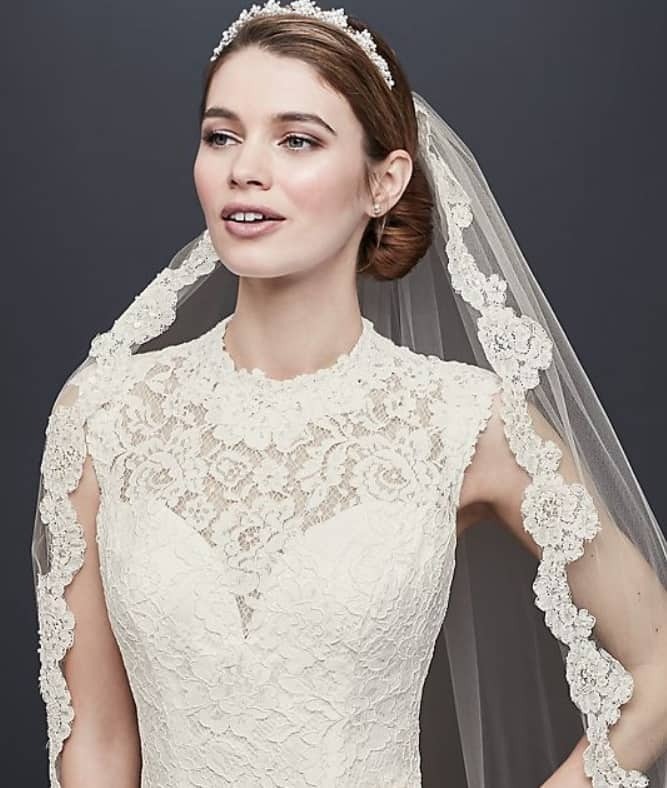 Blusher veils that end just around the neck may also look slightly awkward with a high neck or halter dress that comes up solidly on the neck and collarbones.